Myths involving large and incredible beasts are common around the world; tales of bizarrely patterned, giant cheetahs appear throughout African folklore. While most of these alleged creatures elude science, the king cheetah is a striking exception. While scientists had collected physical evidence of king cheetahs by 1926, some researchers shocked the world in 1981 by finding living king cheetahs at their own facilities. Cheetahs (Acinonyx jubatus) range throughout 25 different African countries, primarily inhabiting savannahs and other open habitats. Capable of running up to 65 mph, cheetahs are the fastest land animals on earth, and hunt speedy prey, such as antelopes and gazelles. Equipped with extremely long legs; small, aerodynamic heads; and powerful respiratory systems, the cheetahs reliance on speed is evident in many aspects of their morphology. Additionally, the claws of cheetahs are permanently exposed, providing them with greater traction at high speed. Most cheetahs have a yellow to brown base color, topped with dark spots. King cheetahs are yellow to brown like their normally colored counterparts, and they are clad with dark markings. However, the spots of king cheetahs often fuse and appear as large blotches, rather than the small spots that are normally present. On the backs of king cheetahs, the spots fuse to form thick stripes. Additionally, the fur of king cheetahs is longer and softer than it is on typical specimens. The pattern of king cheetahs bears a striking resemblance to the “blotched tabby” pattern sometimes seen in domestic cats. King cheetahs are slightly larger than typical cheetahs. In 1926, a farmer purchased an unusual cheetah hide from locals in Macheke, Zimbabwe, and donated it to the Queen Victoria Museum in Salisbury. Early on, some speculated that it was evidence of cheetah-leopard (Panthera pardus) hybridization. The next year, R.I. Pocock described the specimen as a new cheetah species in “Proceedings of the Zoological Society of London,” and named the new species Acinonyx rex, or the king cheetah. By 1980, scientists had accumulated about a dozen king cheetah hides, and a similar number of reliable observations of living king cheetahs. One year later, a male cheetah born at the De Wildt Cheetah and Wildlife Centre in South Africa changed everything, and scientists began to understand exactly what king cheetahs were. Two normal looking cheetah parents produced a litter containing four normal-looking siblings, and the world’s first captive king cheetah. Shortly thereafter, another litter at the same facility contained a second king cheetah -- scientists now knew that a mutated gene causes the unique appearance of king cheetahs. By examining the pattern of inheritance of the king cheetah, scientists could determine that the mutation was inherited in a simple recessive fashion. In other words, king cheetahs must receive the mutated gene from both parents for the gene to be active and produce the different phenotype. 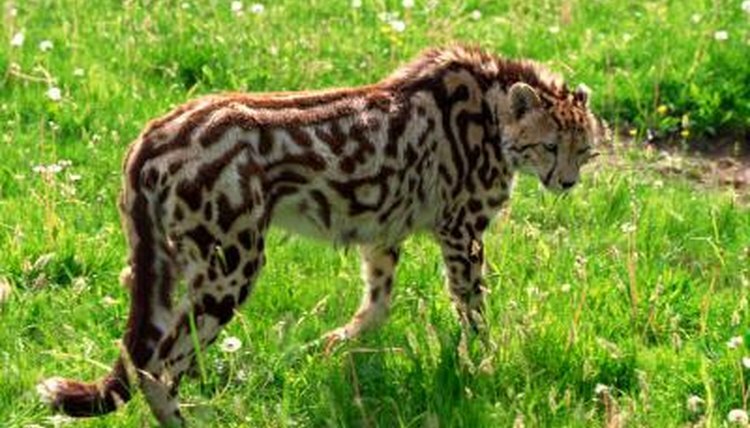 If an animal only inherits one copy of the gene, it will look normal, but be capable of producing a king cheetah offspring if he or she mates with another gene carrier. In 2012, a vast team of scientists, led by Greg Barsh from the HudsonAlpha Institute for Biotechnology and Stanford University, and Stephen O’Brien from the Frederick National Laboratory for Cancer Research investigated the gene further. Publishing their results in “Science,” the researchers found that this simple recessive mutation was not only similar to the mutated gene found in “blotched tabby” domestic cats -- it is the same gene that produces king cheetahs. Proceedings of the Zoological Society of London; Description of a New Species of Cheetah (Acinonyx); R. I. Pocock F.R.S. Science; Specifying and Sustaining Pigmentation Patterns in Domestic and Wild Cats; Christopher B. Kaelin; et al.